Third chapter of "MySQL Cluster 7.5 inside and out". 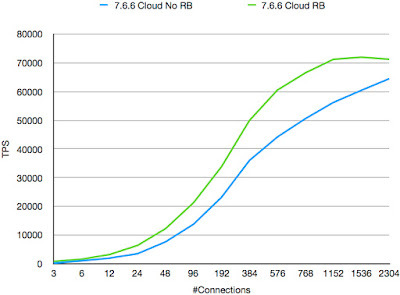 requirements on availability, many networking applications as well. and also uses a number of public examples of use cases. Networking (SDN), Network Function Virtualization (NFV), Voice over IP. list of application types will grow even more. Second chapter of "MySQL Cluster 7.5 inside and out". the various nodes in the telecom network. I was mostly interested in the load it contributed to the network databases. to be used for future telecom services. servers that would be other popular services in the telecom network. throughput requirements and so forth. from the AXE architecture developed in Ericsson. The first chapter from the book "MySQL Cluster 7.5 inside and out". to the checkpoint even if it is not a part that is fully checkpointed. when simultaneously handling lots of inserts. This slowed down checkpoints and in addition it uses a lot of CPU. Thus we wanted a more efficient scanning algorithm in this case. The solution is based on dividing the database into larger segments. size columns that are not defined as using DYNAMIC storage. we can skip checking 300 row entries. the risk of a row in a page being updated is actually fairly low. checkpoints to small parts of a second. to control this if required. messages handling transactions are executed. number of milliseconds before being delivered to the receiver. situation stays for too long, we will run out of REDO log. in queue, so this gives a higher priority to this signal type. to deliver 10 MBytes of checkpoint writes per second. more data to the checkpoints. ensure that we don't run out of REDO log. that we can ensure that we don't run out of REDO log. get into a situation of a complete stop due to running out of REDO log. chance again by sending the new special delayed signal. easily cause ripple effects in a large cluster. 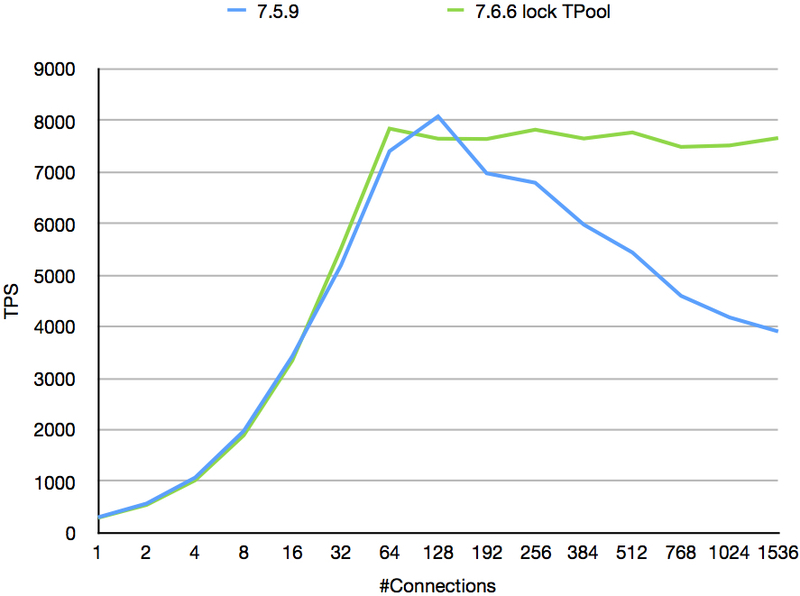 the adaptive checkpoint speed that is introduced in MySQL Cluster 7.6.7.
multiple TBytes per data node. data nodes in earlier versions. 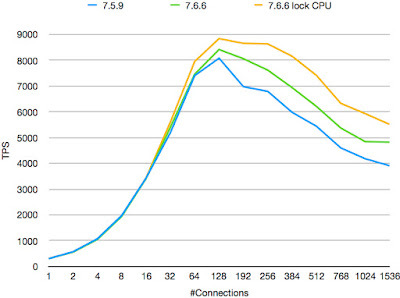 with 1 TByte of RAM, 60 CPU cores distributed on 4 CPU sockets. configuration parameters. The REDO log size was 2 GByte per LDM thread. necessary to set EnableRedoControl=1 in configuration. to use files stored on RAID:ed SSD drives. threads in the cluster knows that we are in a critical state. around 100 MByte of data spread into about 370k rows. The restart is completely similar to the recovery when loading 600 warehouses. plus another 28 seconds when starting the first recovery phases. down when it can take up to 2 minutes before this phase is completed. Total restart time thus became 45 minutes and 32 seconds. and we would even be able to restart more than 2 TBytes within an hour. I developed based on DBT2 0.37 since 2006.
files per warehouse. I load 600 warehouses into NDB. measure the time it takes to restart the data node. the restart analysis would not be substantial. 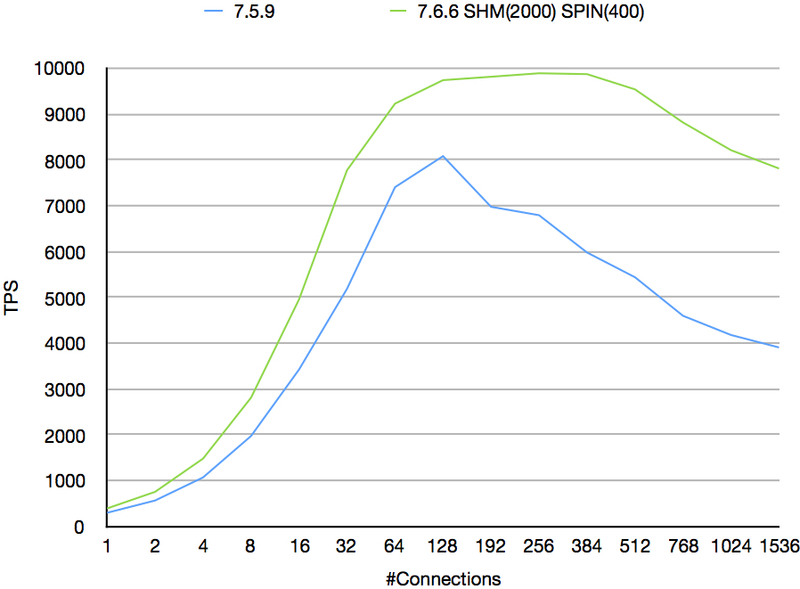 and also both 7.6 GA versions (7.6.6 and 7.6.7). It takes about 3 seconds to stop a node and start it again. This time is constant in all versions. The next step is allocating memory and touching the memory. Allocating memory doesn't actually commit the memory to RAM. This step takes 26 seconds for all versions. The time of all these phases are dependent on the version. these settings and the database size takes about 20 minutes). Thus 7.3 would add approximately 10 minutes to the restart times. Restore phase in 7.4.21 and 7.5.11 only takes about 5-10 seconds. loaded from the REDO log. 3 minutes and 32 seconds. since checkpoints are executed with 15-20 seconds intervals. Next we analyse the phase that rebuilds the ordered indexes. the ability to lock the index build threads to more CPUs. 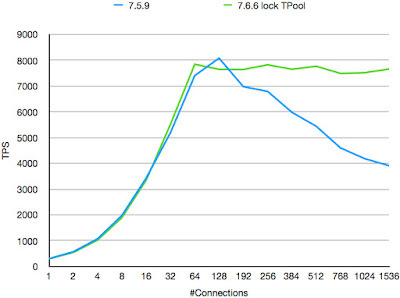 In 7.6 we changed the default of BuildIndexThreads to 128.
lock to more CPUs compared in 7.5.
of this phase in 7.6. The synchronisation phase takes 1-2 seconds in all versions. occurred during the restart (happens in live node). we wait for a checkpoint to complete that we participated in. complete and next to participate in another checkpoint. 7.5.11. It was pure luck in timing the checkpoints. 12 minutes and 26 seconds. is executed within a few seconds. a new one is very fast. In this benchmark it took only 5 seconds. database size and the size of the ordered indexes. due to metadata locks and other reasons. Many DBMSs work hard on automating management of the database nodes. on all LDM threads, thus on the entire data node. seen, this is the checkpoint speed that will be used in normal operation. Defaults to 20 MByte per second. defaults to 50 MByte per second. speed when the CPU or the disk is overloaded. avoid changes of behaviour in a GA released version of MySQL Cluster. In earlier versions of NDB it was necessary to have very large REDO logs. twice the size of the DataMemory. log size works perfectly even when loading TBytes of data into NDB. Remember that EnableRedoControl needs to be set to 1 for this to work. this product should be roughly two times the setting of DataMemory. increase this setting to 256 MByte (set to 256M). This gives a REDO log size of 200 GByte. 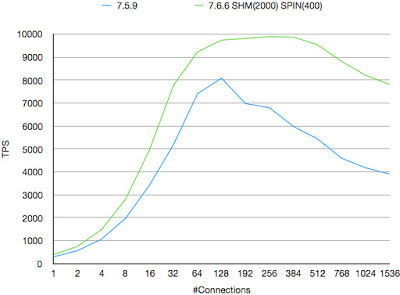 The setting of disk write speed will be discussed a bit more in a coming blog. In 7.6.7 one can instead configure as follows. NoOfFragmentLogParts should still be set to the number of LDM threads. write your backups using the variables MinDiskWriteSpeed and MaxDiskWriteSpeed. should be able to handle around 100 MByte of disk writes per LDM thread. in this case (500 MByte per second). highly available DNS/DHCP servers using MySQL Cluster. NDB for DNS and DHCP is Kea, here is an article describing how to setup Kea using NDB. into NDB in each data node. A node restart of 7.5.10 using this data set takes 19 minutes and 11 seconds. In 7.6.6 this restart takes 6 minutes and 49 seconds. variance. The restart time in 7.6.6 has much smaller variance. We will look into the different restart phases and see how those are affected. per second. In this case it takes 26 seconds in both 7.5 and in 7.6. The next step is the restore phase where we recover data from a local checkpoint. After this we execute the UNDO log, this particular benchmark has no disk data. phase is dramatically faster in 7.6 if used. reason it isn't twice is since we make use of hyperthreading to speed things up. 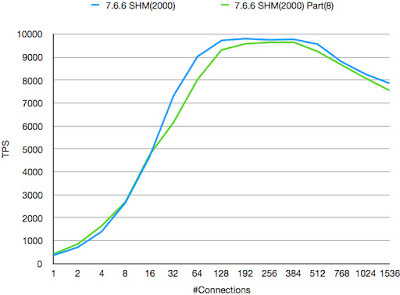 differences in this phase between 7.5 and 7.6.
default. In this execution 7.5 took 13 minutes and 48 seconds in this phase. no activity is ongoing. So the total time for this phase 2 minutes and 8 seconds. experiment have been done with fairly conservative numbers. size that is common in 7.5, with larger sizes the difference is much bigger. The first scenario is when data nodes and MySQL Servers are not colocated. 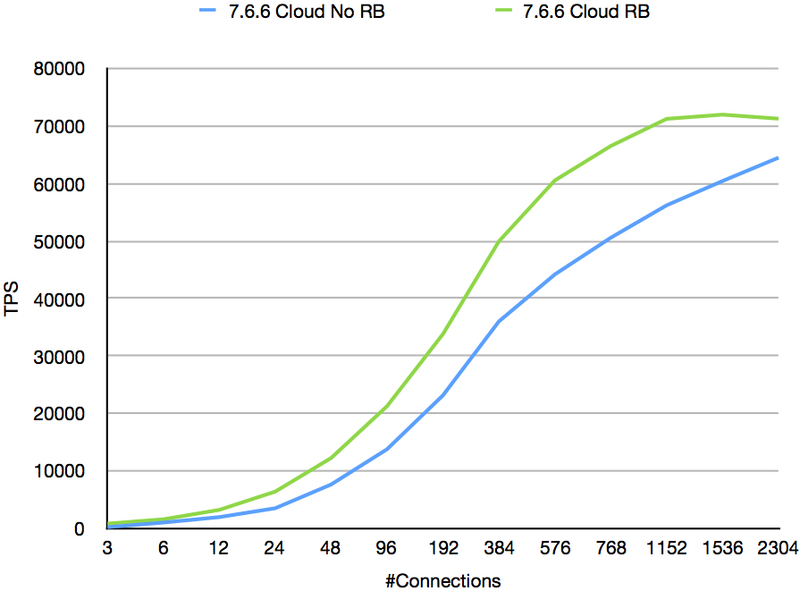 the same availability domain (availability zone in Amazon/Google) or not. In your own network other scenarios could exist. to configure nodes to be contained in a certain location domain. replica placed in the same location domain as the transaction coordinator. in the same availability domain. when the data nodes and MySQL servers span multiple availability domains. nodes. Each of those 3 replicas reside in a different availabilty domain. the improvement is above 40%. to be persistent on the MySQL Server. 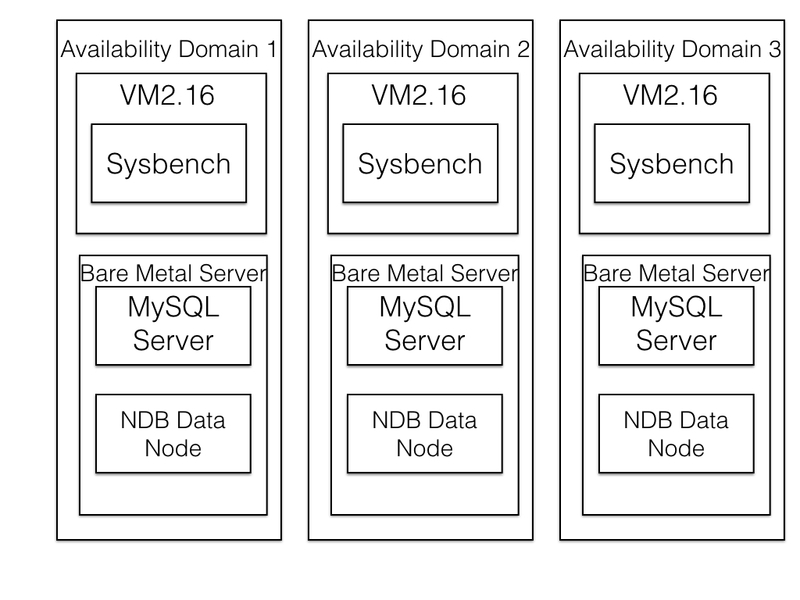 A new week of blogs about our development in MySQL Cluster 7.6.
a comparative analysis for a few more versions of NDB. performance as a query on a single-partition table. per table and using 8 partitions per table. used. Thus we haven't focused so much on the CPU usage in data nodes. scans is though a bit more variable in its throughput. are not pruned to one partition will be automatically parallelised. 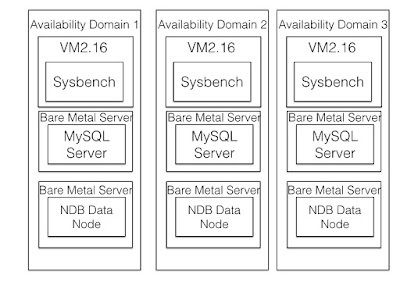 This is the advantage of the MySQL Cluster auto-sharded architecture. many shards and merging the results from many shards. join queries using a parallel linked-join algorithm. down to the NDB data nodes. 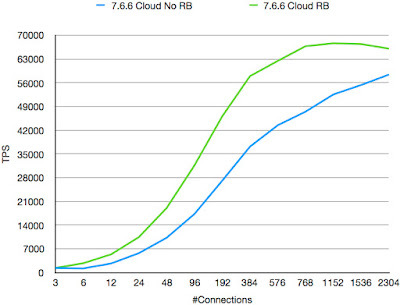 show how the performance is impacted when running on the Oracle cloud. will also communicate to another availability domain. 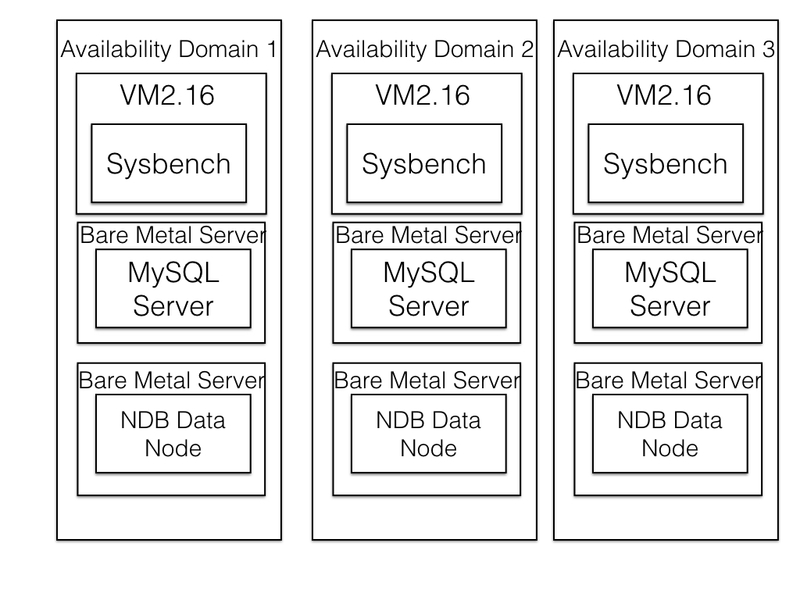 combined data node, MySQL server and place to run the Sysbench application. storage of around 500 GByte and a few TBytes of disk data columns. 100 rows from the database and finally a BEGIN and a COMMIT statement. different sysbench programs are started in a synchronous manner. 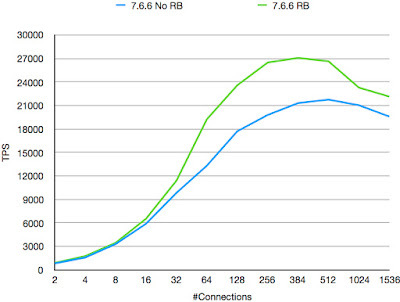 increases the latency of application responses. the improvement of using the Read Backup feature is stable around 50%. is not in the same availability domain. pretty good given that each transaction has 16 SQL queries to execute. setup the difference is around 30%. 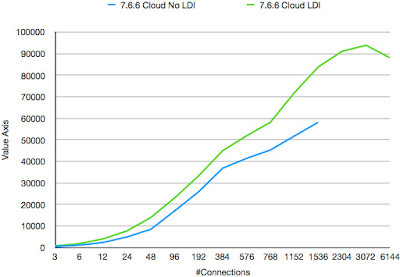 be able to handle their latency requirements in the Oracle Cloud. 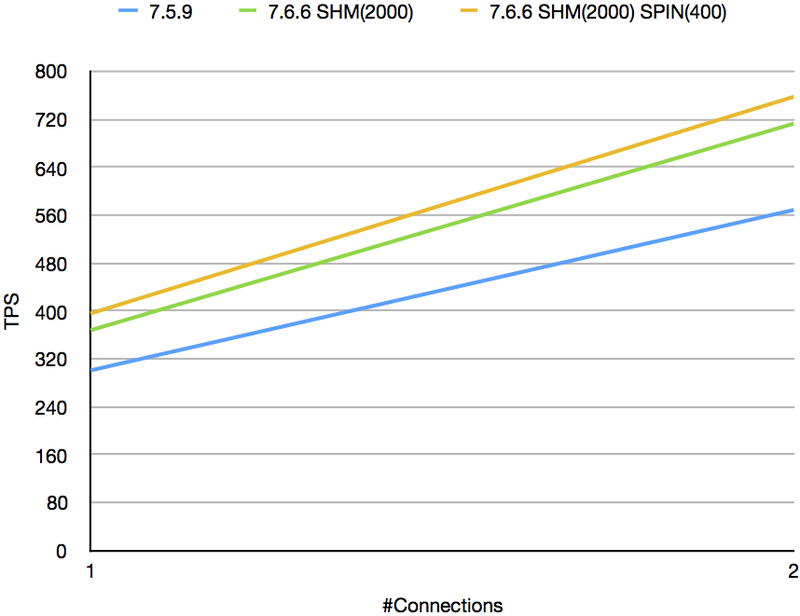 In a later blog I will describe exactly what I did to setup those benchmarks. installation that it makes it possible to replicate any benchmark setups. for those tables and still see our own updates. can be read for committed reads. impact of using read backup in a colocated scenario is even bigger. grows all the way up to 30%. the performance starts to drop. the current implementation NDB can be used perfectly fine with the thread pool. 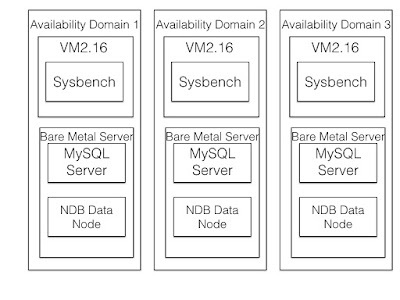 NDB in combination with MySQL servers that use more than 16 CPUs. counts, but it continues to deliver good results even when passing the 512 thread limit. actually increases a small bit as the number of threads increase. 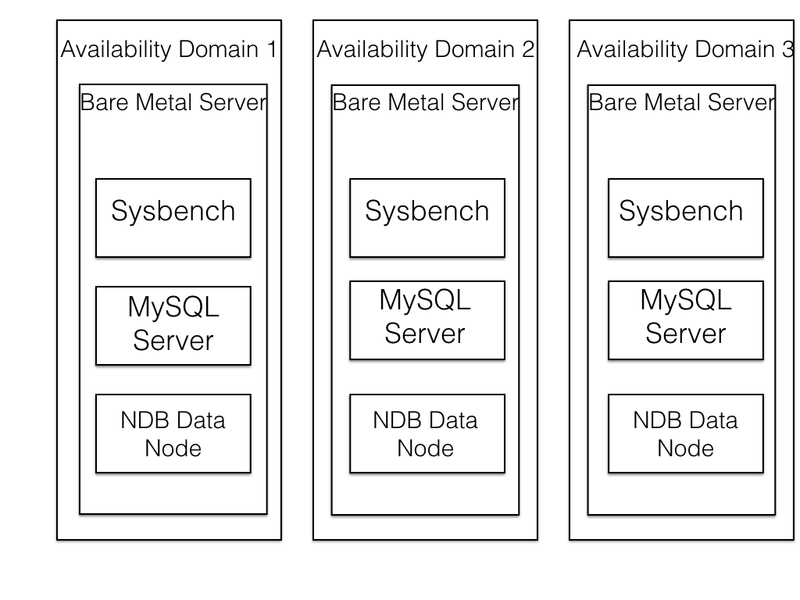 the MySQL Server and the NDB data node for scalable applications. where the application isn't close to the data. makes sense to colocate the MySQL Server and the NDB data node. the case of a crash. and they can crash independently of each other. introduced tables that can be fully replicated in MySQL Cluster 7.5.
to the data node we are in. 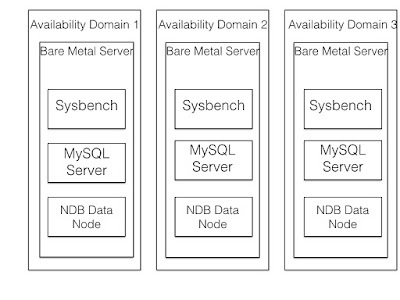 This means that we expect NDB to work very well in SQL applications. 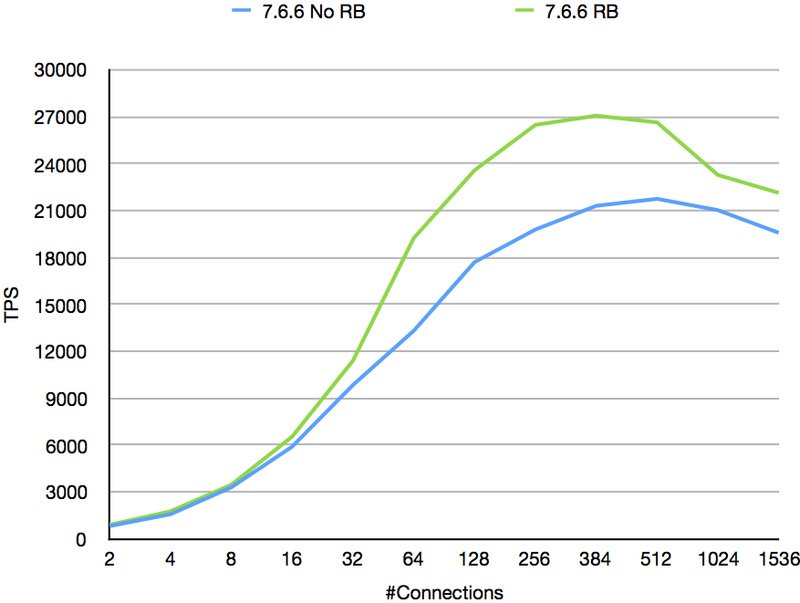 NDB by supporting more and more push down of joins to the NDB data nodes. integrate all the changes in MySQL 8.0 into MySQL Cluster as well. 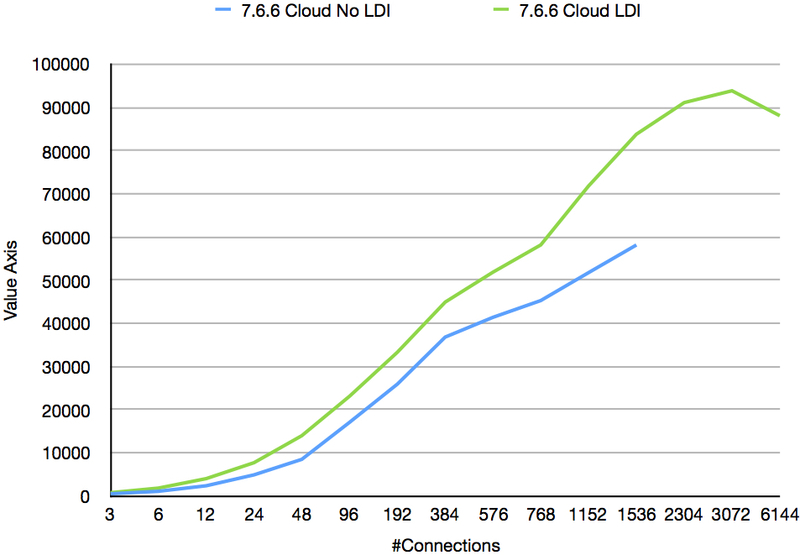 one in each availability domain of the Oracle Cloud. this blog we will always use this CPU locking. 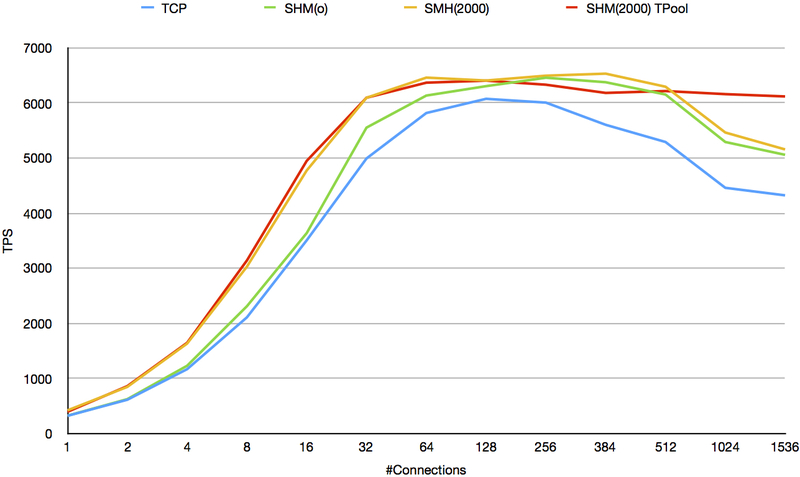 simply replacing the TCP transporter with a shared memory transporter. transporter to use spinning for a while before it goes to sleep. is 10% at top performance and more than 40% at very high concurrency. easier to get to this top performance. 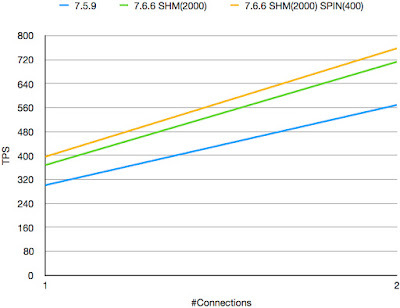 MySQL Server need less concurrency to reach high performance levels. data nodes are configured using the ThreadConfig variable in NDB data nodes. only supporting shared memory transporters on Linux at the moment. improvement, all comparing to the result in using 7.5.9.
achieved with all improvements in 7.6. 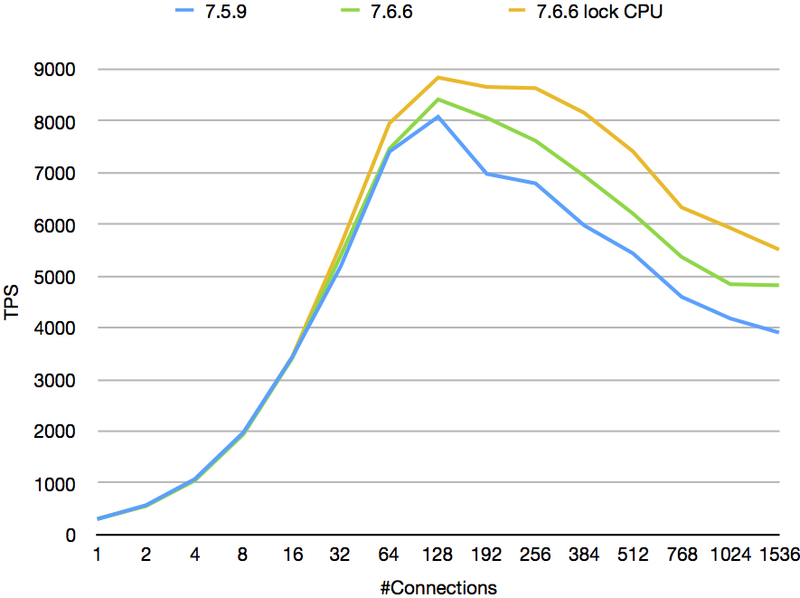 In MySQL Cluster 7.6 we introduced a new thread type in the NDB API. assist in receiving messages from NDB. There is also a connection thread that listens to new connections and connects to the NDB data nodes. that uses the NDB cluster connection. To avoid this problem we added a new thread in the NDB API in MySQL Cluster 7.6.
ensured that user threads are woken up as quickly as possible. wakeup calls to the wakeup thread. to the wakeup thread we improve performance of the application. receive thread and that this thread is locked to a specific CPU. should specify one CPU per cluster connection. CPUs not interfering with the NDB API receive thread. 20% more at high thread counts. of high throughputs at high thread counts. 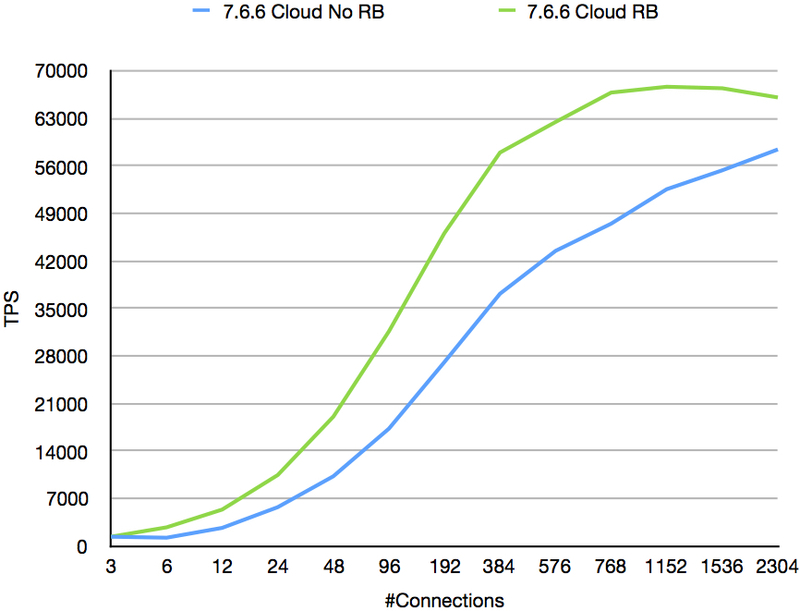 MySQL Cluster 7.6 is now released as GA. 7.6 contains a lot of interesting changes. Here is a list of changes in numbers in the recent MySQL Cluster versions. Cluster are 3-4x faster for a database size of around 60 GByte. 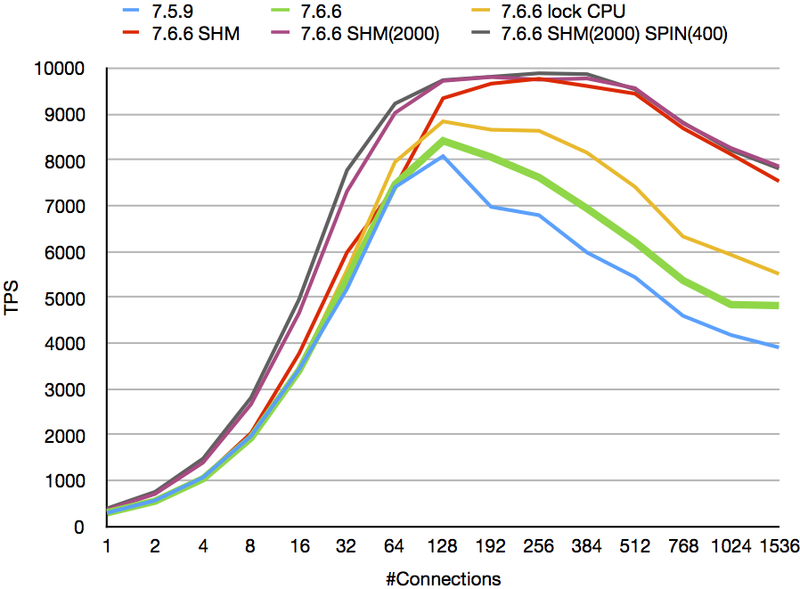 some benchmark queries we have tested with up to a factor of 2.
can improve throughput on low thread counts as much as 60%. 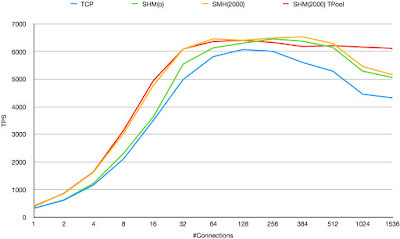 performance increases around 50% even in a network with a very high bandwidth. reads within the same availability domain shows 50% improved throughput. by a factor of 5.
the index build phase of the restart by a factor of 2.
backup that can speed up restore by at least a factor of 2.
cloud environment and finally an improved throughput on each API node. than 1 GByte per second. These devices are extremely small and still very powerful. I have an Intel NUC at home that has two of those devices. Thus the performance difference between disk storage and RAM has decreased. Thus HW development is making the NDB engine more and more interesting to use. sized part that is accessed through a pointer from the fixed size part. implemented on caching techniques that was state of the art a few years ago. but to be more permanent in the page cache a page has to be accessed several times. record even if the page is not in the page cache. page state records compared to the amount of pages we have in the page cache. suitable for this new generation of HW.